The First World War was a pivotal moment in Canadian history, considered by many to have played a large role in defining the early Canadian identity. However, introducing WW1 to Students can be a challenging feat; the horrific nature of this war is difficult to breakdown and represent to young minds. 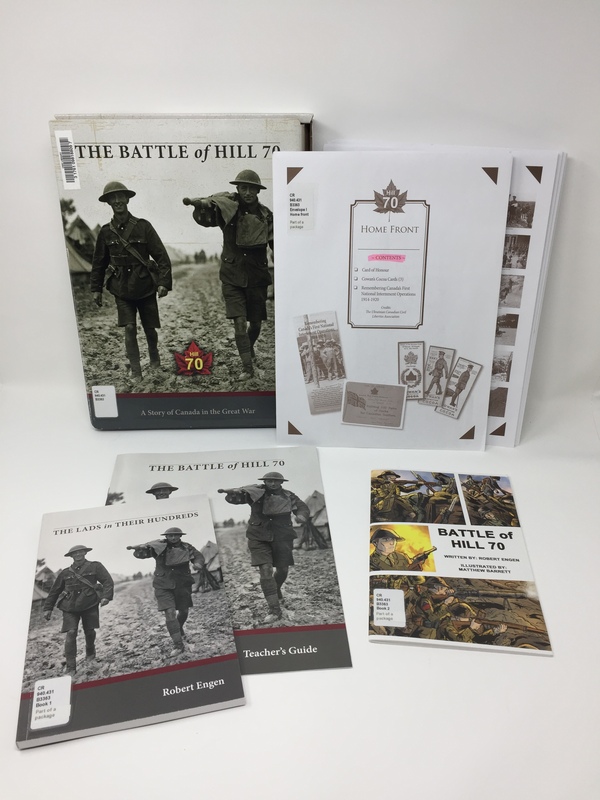 “The Battle of Hill 70: A Story of Canada in the Great War”activity kit was designed to introduce your students to the First World War. The Kit allows your students to actively engage with WW1 material, and learn about the people who endured this horrific event. This kit encourages students to divide into small groups and engage with the various topics this kit organizes. Within the envelopes above are various kinds of replicated media from the period, including posters, postcards, photographs, artwork, etc. Inside the Learning Strategies & Profiles envelope there are 12 topics represented by letters A-L. Each of these profiles include a worksheet summarizing a group’s task, and highlighting which coordinating booklet which provides the necessary information within. Within the teachers guide there are three suggested activities designed to help your students engage with the material. Students in small groups or pairs will each receive a profile and its corresponding booklet. Task students to read the booklets and to select at least four of the items listed under the heading “learning activities” on their profile and commence their research. The students will read, research, and prepare a visual piece along with an oral presentation, to present to the class. Create two visual items, (Venn diagram, chart, letter, drawing, video, social media account) to display to the class or school. Let your students’ creative sides shine by having them be curators for the local museum. Assign a profile to groups of 3-4 and have them create an exhibit using materials they source from online, and the media in the envelopes provided. Have the students “pitch” their idea to the museum board explaining their choices, and what they learned, to the class. Overall this activity kit is an excellent source to use when introducing your class to the First World War. Students will enjoy the group work while learning about one of Canada’s monumental events. This kit is located on the 3rd Floor of the library in the Curriculum Resources area.